The reason why people actually care about their work? You. As a manager, you have the power to make them happy, productive and motivated. And SoapBox can help. Let’s say you have seven direct reports. That means seven one-on-ones. Seven calendars. Seven agendas. Seven sets of meeting notes. It’s hard to keep track of the people stuff. With SoapBox, your one-on-ones are perfectly organized in one place. 🙌 Your shared agenda is created like magic. Your meeting notes and decisions are accessible right from the agenda. And your next steps are assigned with a single click. You’re both organized and prepared, every time – so you can focus on the conversation. Sign me up!Tell me more! How do you tap into your team’s pulse? You ask them. Team meetings can be a powerful tool for boosting performance, morale and collaboration – when they’re done right. That’s where SoapBox comes in. Your meetings start with a shared agenda that everyone has contributed to. They end with detailed minutes, and assigned next steps that everyone can access. Even your remote workers feel as though they’re in the room with you – all because of our easy-to-use app. Effective meetings start with a shared agenda that everyone can see beforehand and add to. But chasing everyone down can be a huge time-waster (especially for remote teams!). SoapBox makes the process easy. Recurring items pop up in each agenda, and items that weren’t discussed last time automatically move to the next agenda. It’s hard to keep track of all those meeting notes in a way that’s actually useful later. 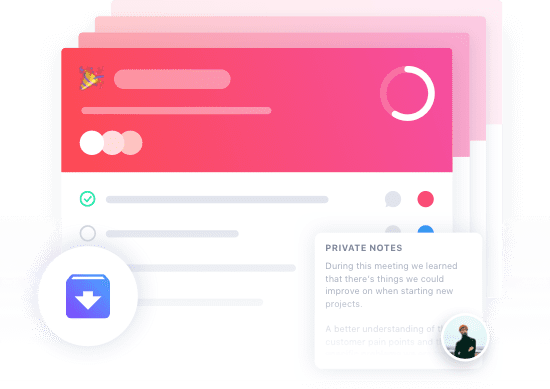 But SoapBox comments and summaries provide you with a meeting minutes tool that lets you take notes right in the agenda. Archived meeting notes are accessible right below the current agenda, so you can track down a decision (or prep for performance review season!) quickly and easily. Assigning action items – and following up on them – is a crucial component of effective meetings. But it can feel pretty overwhelming. Nail those action items with SoapBox’s Next Steps feature. As you move through the agenda, assign action items and deadlines without missing a step. Next Steps will show up in their SoapBox, so they always know what’s on their to-do list. 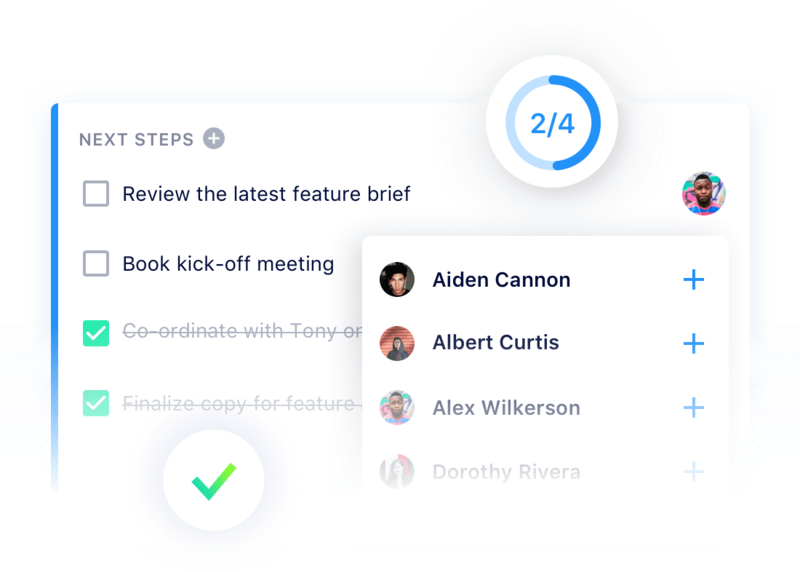 Use Meeting Rating to get quick and easy feedback from your team on how effective your meetings are. 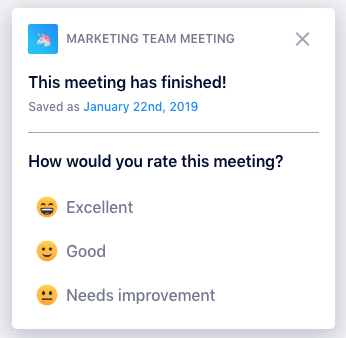 Whenever you finish a meeting, Meeting Rating automatically sends out a quick post-meeting survey question to all participants. 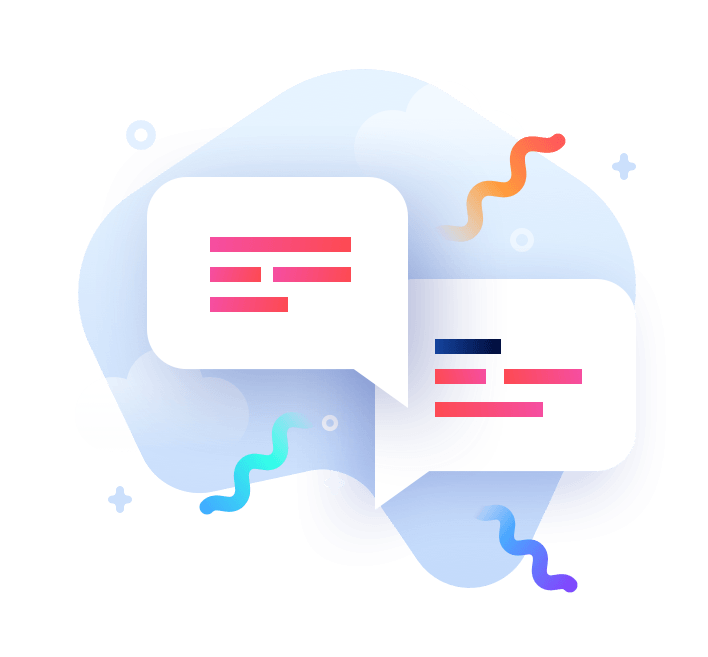 You can choose from one of three questions and responses, so you’re collecting the feedback that’s useful to your team. 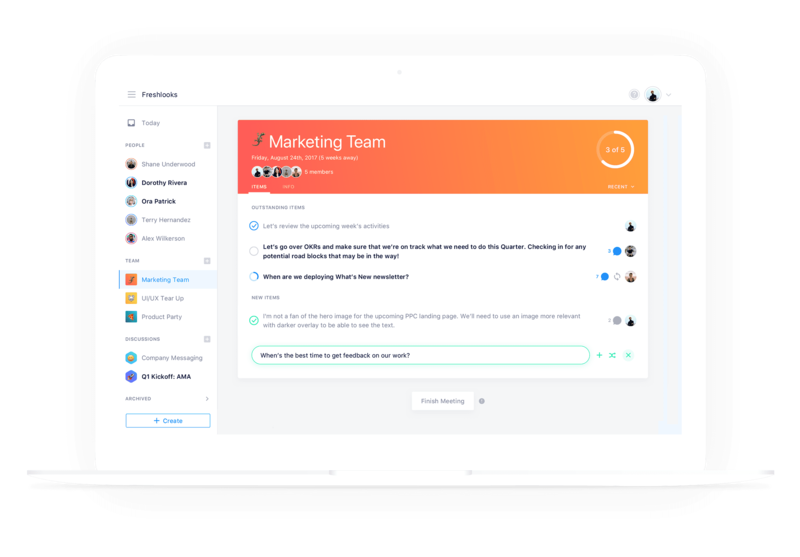 SoapBox is the feedback tool your team will actually want to use. Launch a retrospective, a project kickoff and more, all from one emoji-filled place. 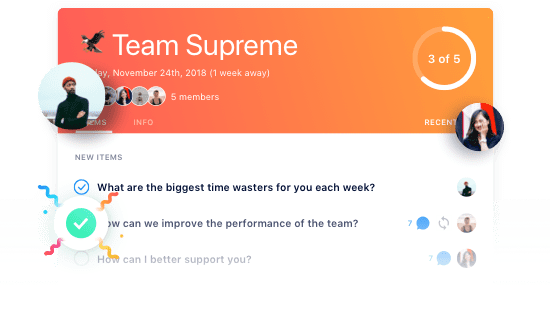 Answer your team’s most pressing questions, no matter what time zones you’re all in, by setting up an AMA Discussion through SoapBox. Top-voted questions move right to the top, so that you know what they’re really wondering about (and you can answer them once, not a hundred times). 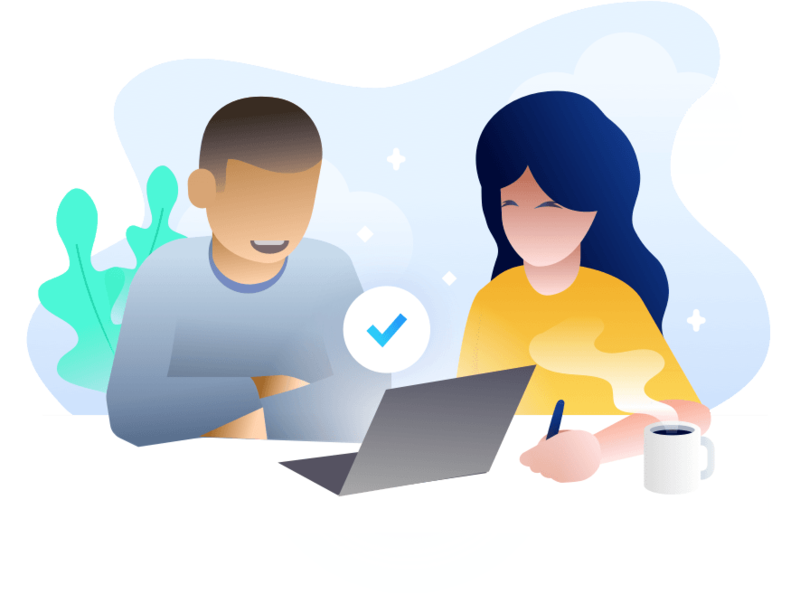 With Discussions, you can keep all your employee ideas and suggestions in one place. Your team can vote and comment on ideas – and you can make decisions way, way faster. "I like the fact that the agenda for the weekly meeting is sort of a growing/evolving thing. We add topics during the week as they pop up and sometimes that even allows the other people to give a quick reply right then so there's no need to bring it up at the meeting. Other times it gives us time to research an answer before the meeting." Be the amazing manager they need.